The recent headlines have been focusing on the Israeli "Flotilla raid", specifically the raid on the Mavi Marmara. This week, we give you 5 (five) maze cartoons centered around this topic. You may use these for editorial purposes and in any other way you'd like, no charge. Follow this link to view this week's maze cartoons. * Erdogan's comparison of flotilla raid to 9/11; How does it stack up against the Armenian Genocide? * The things the flotilla has left in its' wake. * Israel's public relation teams: 3 stooges and a barrel of monkeys. 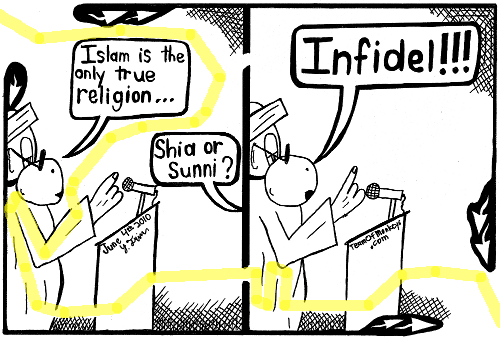 * Which form of Islam is true? * Who you calling chicken? Turkey AKP surrounded by terrorist chickens. Yonatan Frimer is a syndicated editorial cartoonist. Aside from being laugh-out-loud funny,or at least chuckle-worthy, each of Frimer's cartoons is also a maze. In anticipation of his soon-to-be-announced book, he is releasing 6-months worth of editorial cartoons on current events at no charge to newspapers and news outlets around the world. Yonatan Frimer is also available as a freelance maze artist & cartoonist, able to create custom mazes for your newspaper at only $250 per maze. He can make custom mazes for your puzzles section, portraits of your staff, poke fun at local issues, or anything else you might want. You may print or publish these cartoon mazes at no cost. Links to printable versions and the solutions are under each cartoon. Yonatan Frimer is available as a freelance cartoonist, for more info click here. To order prints-on-demand of these cartoons and other mazes for your offices, please click here.